August 3, 2014 August 3, 2014 / Rachel C.
As I said in my last post, I am not very happy about this particular challenge. I don’t own any 3D nail art elements aside from a handful of rhinestones (in a single color), and I really really did not want to make anything out of acrylic. That’s just a pain because I cannot get acrylic powder to work correctly. 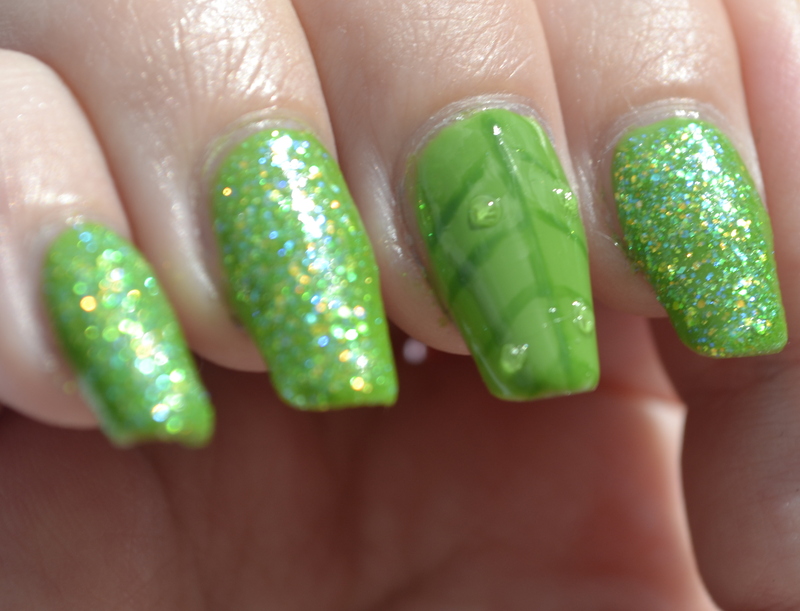 So I stretched the theme and did ‘leaf’ nail art with 3D dewdrops. Well, the dewdrops are technically 3D. They don’t stand out a whole heck of a lot, but they do still count. It actually looks kind of cool, especially in the angled shots. Much better than the least time I tried this. 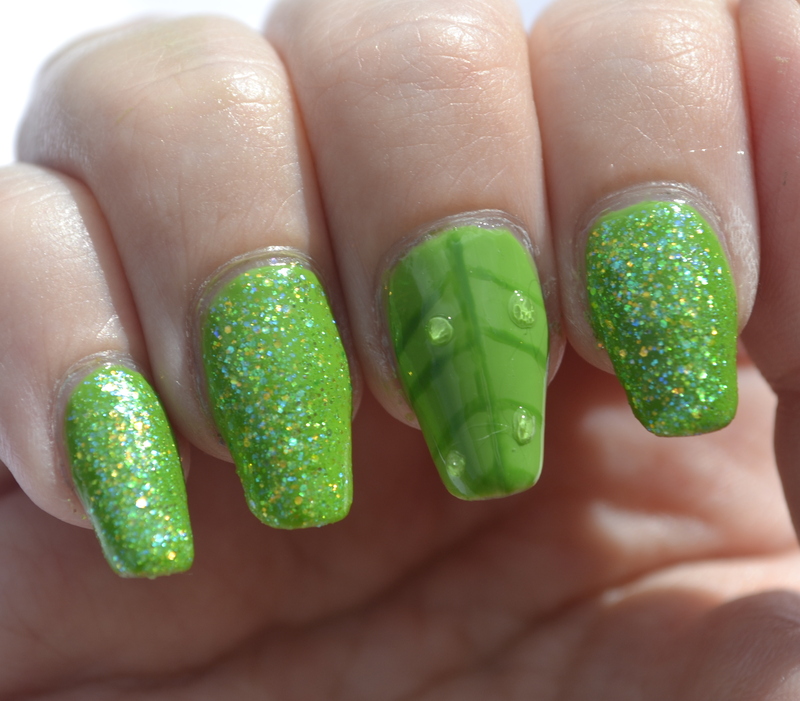 The dew is made with a slightly dried out top coat, dotted onto the leaf. 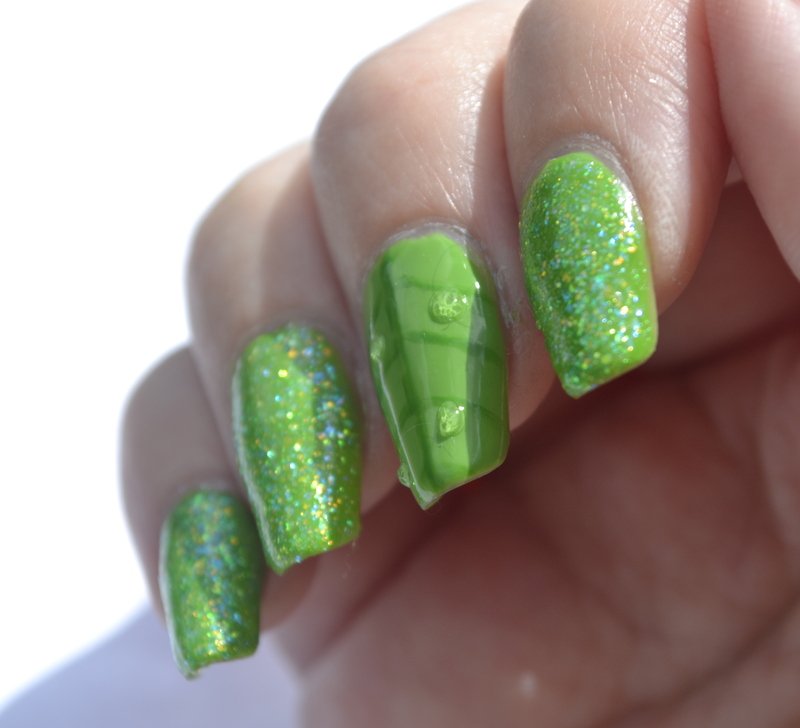 The leaf is made with China Glaze Gaga for Green and Sinful Colors Exotic Green, and the glitter nails are China Glaze Sour Apple over Gaga for Green. In retrospect, I could have tried out ellagee What’s With the Glasses?, which is a polish based on the 3D glasses that the Tenth Doctor wears in Doomsday. I am glad that that I didn’t think of it until after I had finished this though, because I do like my dewdrops. For the next challenge I will be doing ikat nails, a first for me!